The growth of disposable income generally improves quality of life and fuels the demand for chilled and frozen food and beverages. Such demand is also affected by changes in consumer habits. Improvements in the standard of living allow more people to eat out. This trend is reinforced by an increase in the number of restaurant chains and the rapid expansion of fast-food networks around the world, particularly in India, China, South East Asia, and Japan. These trends positively affect demand for commercial refrigeration equipment used for the conservation of food and beverage. Over and above the demand generated by the opening of new sales outlets, commercial refrigerators are used as displays, or ice cold merchandisers (ICMs) that offer a platform for visual communication and merchandising, thereby promoting impulse buying and facilitating brand recall. The concentration of populations in major urban centers and the increased participation of women in the labor market contributes to changes in eating habits. One such change is the higher consumption of frozen foods and refrigerated drinks. Key factors driving growth of the freezer and beverage & wine coolers market include increased consumption of packaged foods and non-alcoholic drinks, growth of modern grocery retailers, and a boom in the tourism industry. With various advancements in refrigeration technology, freezer and beverage cooler products offer energy-efficient consumption and cost-effective energy saving solutions to achieve effective cooling and refrigeration for applications in various end-use sectors. The market for SEA beverage coolers has been segmented on the basis of product types into beverage coolers and wine coolers. 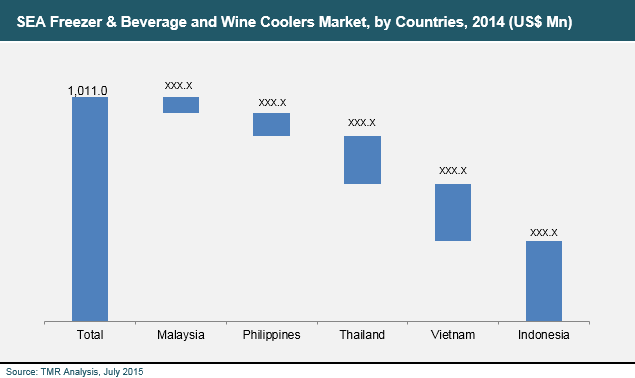 Beverage coolers was the largest segment in 2014, accounting for 58.3% share of the overall SEA beverage coolers market. The wine coolers market is estimated to be the fastest-growing segment, expanding at a CAGR of 7.8% during the forecast period from 2014 to 2022. Due to increased consumption of soft drinks and nonalcoholic cool beverages, there has been massive growth in demand for the installation of beverage coolers across the SEA region. The beverage cooler market is further segmented into beverage coolers and wine coolers. The SEA beverage cooler market was dominated by beverage coolers, with a market share of around 58% in 2014. Based on the capacity range, the SEA freezer and beverage cooler market is segmented into 500 & above litres, 300 to 500 litres, 200 to 300 litres, and 200 and below litres. The growth of the service and hospitality sectors, including food chains, restaurants, and the tourism industry, as well as a change in consumer habits have led to a rise in the storage of frozen food and food-related products. In order to accommodate increased consumer demand, c-store owners, supermarkets, and other point-of-sale outlets are pitching for higher-capacity freezers, leading to a shift from traditional 200 & below liters to 300 to 500 liters and 500 & above liters capacities. The different door types for beverage coolers are categorized as 4 doors & above, 3 doors, 2 doors, and 1 door. Pubs, bars, and HORECA choose best-fit wine coolers in order to fulfill their requirements, basing their choices on factors such as space and quantity/capacity to hold wines/alcoholic beverages, in order to effectively cater to consumers, including tourists, expatriates, and locals in SEA. At approximately 58%, the beverage coolers segment held the largest market share of the overall SEA beverage cooler market. By country, Indonesia was one of the largest contributors to the SEA freezers and beverage & wine coolers market in terms of revenue in 2014. Market growth in Indonesia is likely to be largely driven by increased spending by consumers, changes consumer lifestyles, and more locally manufactured freezers, which has led to affordability and competitiveness. This resulted in faster replacement periods and encouraged freezer end-users to have more than one capacity option to serve growing demand. Leading companies operating in SEA in the freezer and beverage coolers market include AB Electrolux, Concepcion Industrial Corporation (CIC), Frigoglass SA, General Electric Corporation, Hoshizaki Singapore Pte Ltd., Midea Group, Sharp Electronics Co. Ltd., and South East Asia Hamico Export JSC. Domestic manufacturers include PT. Royal Sutan Agung (Indonesia), The Cool Company (Thailand), PT. Indotara Persada (Indonesia), and SAMEMAX Refrigeration Sdn. Bhd. (Malaysia). This report aims to provide comprehensive strategic analysis of the SEA freezer and beverage coolers market along with the market size and growth forecast for the period from 2014 to 2022. Key factors driving the growth of the freezer and beverage cooler market include increase in packaged foods and non-alcoholic drinks, growth of modern grocery retailers and tourism industry. With advent of refrigeration technology, freezer and beverage cooler products offer energy efficient consumption and cost effective energy saving solutions to achieve effective and efficient cooling and refrigeration process for various application in end-user sectors. This research study on the SEA freezer and beverage cooler market provides detailed analysis of freezer and beverage cooler at country level. The study also aims to explain the driving forces behind the rising demand for freezer and beverage coolers in various application sectors. The report also offers an in-depth analysis of various factors such as market drivers, restraints, and growth opportunities affecting the market dynamics. These factors enable the analysis of various trends that would impact the market during the forecast period from 2014 to 2022. This report includes comprehensive coverage of the underlying economic and technological factors under key trends analysis influencing the SEA freezer and beverage coolers. Furthermore, this report intends to provide strategic insights into the ecosystem of SEA freezer and beverage cooler market by value chain analysis. The market positioning analysis of key players, market share analysis by brand and manufacturer sheds light on the prevalent competition in this market. Various factors that affect the growth of SEA freezer and beverage coolers market have been identified in this report. The report aims to provide a comprehensive analysis of the SEA freezer and beverage coolers market across product types, capacities and door types. Also, the report provides a competitive landscape of the SEA freezer and beverage coolers market and identifies various business strategies adopted by manufacturers. Under the company profiles section, the report provides an overview of companies operating in the market, strategies deployed by them in the bid to gain competitive advantage, annual revenue generated by them in the past two years, and recent developments. Companies profiled in this report include AB Electrolux, Concepcion Industrial Corporation, Frigoglass SA, General Electric Corporation, Hoshizaki Singapore Pte Ltd., Midea Group, Sharp Electronics Co. Ltd., South East Asia Hamico Export JSC, PT. Royal Sutan Agung, Samemax Refrigeration Sdn Bhd., Sanden Intercool and The Cool Company among others.